Just a little device I wanted for my work- /practice-space. 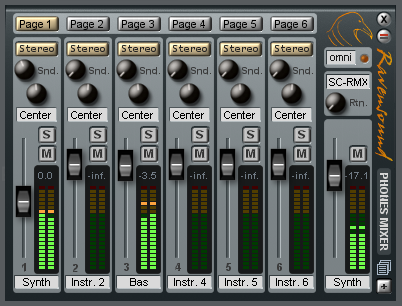 It’s probably overdoing it, but I like having this in a small window, so I can have other things like fx and synths visible, when playing with a band here It’s a bit hungry on dsp, but remember that 6 stereo inputs are individually mixed to 6 stereo out. There’s a small “inconsistency”. The settings panel will show up detached, trying it’s best to have nothin to do with the mixer, until you move the mixer panel. Please let me know, if you find a bug It does run on Scope4 (if anyone didn’t catch the update offer from SC ).